What makes Matcha what it is? Here is a brief overview of the powerful components within Matcha Green tea and matcha benefits. The effects of L-Theanine are truly amazing. Theanine benefits the entire central nervous system. It has the unique ability to stimulate the production of alpha waves in the brain; a state otherwise mostly achieved by meditation and characterized by a calm alertness and relaxed mental clarity. This is one reason why the Zen monks appreciated a good cup of Matcha before their "lengthy" meditation sessions. The relaxing effects of L-Theanine act antagonistically against the stimulatory effects of matcha caffeine on the nervous system thus smoothing the body's reaction and leading to an experience of dynamic bliss. Clinical studies have also shown L-Theanine to reduce stress, to lower blood pressure, to improve memory and learning abilities, to diminish PMS symptoms and to have a mild antioxidant activity. L-Theanine is fast acting, the desirable effects are generally noticeable within the first 30 minutes after enjoying a Matcha green tea latte and can last for up to 6 hours. Basically theanine benefitsmatcha absorption in the bodyso rather than take theanine as a supplement why not drink your theanine naturally in a whole food such as a matcha latte! 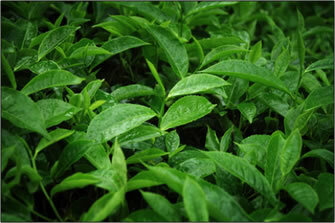 Chorophyll – Matcha contains extremely high levels of Chlorophyll, thus the brilliant emerald green color. Chlorophyll is one of the most powerful blood detoxifyers, as well as supporting a healthy blood alkalinity. Adaptogenics – Green tea is an "adaptogen" which means it supports the adrenal glands by lowering levels of the "stress" hormone Cortisol. Matcha is definitely considered to be one of the top foods for an adrenal fatigue diet! Cholesterol Lowering agents – Green tea has been shown to decrease the levels of LDL ('bad") cholesterol while having no effect on HDL ("good") cholesterol. Now you have more reasons to start your day with a matcha green tea latte!